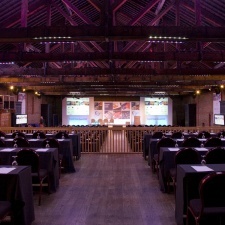 The Brewery has played host to many of London's most iconic events and high-profile conferences. Set within their own private courtyard, The Brewery provides a welcome respite for guests seeking solace from today's identikit venue options. Spaces are unique, attitude to service unassuming, and locally sourced produce headline the acclaimed menus. An idyllic oasis, this member's club is one of London's most precious spots. A blank canvas with so much potential for corporate events that Saatchi probably has his eye on it.